Autophagy is a fundamental process for degrading and recycling cellular components. Autophagy has been known for over fifty years, but its fundamental importance was only recognized after Yoshinori Ohsumi’s paradigm-shifting research in the 1990’s. For his discoveries, he is awarded this year’s Nobel Prize in physiology or medicine. In the mid 1950’s scientists observed a new specialized cellular compartment, called an organelle, containing enzymes that digest proteins, carbohydrates and lipids. This specialized compartment is referred to as a ‘lysosome’. The Belgian scientist Christian de Duve was awarded the Nobel Prize in Physiology or Medicine in 1974 for the discovery of the lysosome. New observations during the 1960’s showed that large amounts of cellular content could sometimes be found inside lysosomes. The cell therefore appeared to have a strategy for delivering large cargo to the lysosome. Further biochemical and microscopic analysis revealed the transport system to the lysosome (Figure 1). Christian de Duve coined the term autophagy, ‘self-eating’, to describe this process, so the newly discovered vesicles were named ‘autophagosomes’. 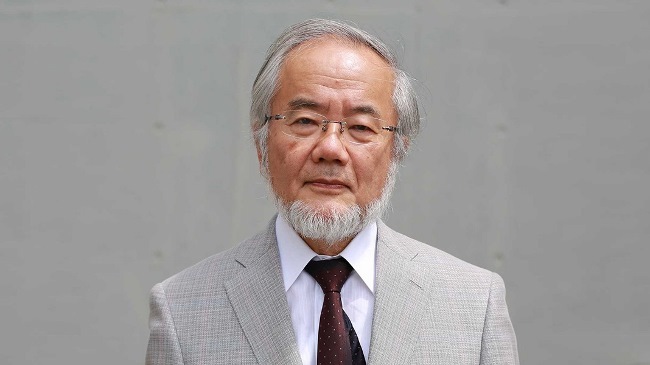 Difficulties in studying the phenomenon meant that little was known until Yoshinori Ohsumi used baker’s yeast in the late 1980s to identify genes essential for autophagy. He then went on to elucidate the underlying mechanisms for autophagy in yeast and other organisms. Upon starting his own lab in 1988, Ohsumi focused his efforts on protein degradation in the vacuole, an organelle that corresponds to the lysosome in humans cells. Yeast cells are relatively easy to study and consequently they are often used as a model for human cells. But Ohsumi faced a major challenge: yeast cells are small and their inner structures are not easily seen under the microscope, and thus he was uncertain whether autophagy even existed in yeast. He reasoned that if he could disrupt the degradation process in the vacuole while the process of autophagy was active, then autophagosomes should accumulate within the vacuole and become visible under the microscope. He therefore cultured mutated yeast lacking vacuolar degradation enzymes and simultaneously stimulated autophagy by starving the cells. The results were striking: Within hours, the vacuoles were filled with small vesicles that had not been degraded. The vesicles were autophagosomes and Ohsumi’s experiment proved that authophagy exists in yeast cells. But even more importantly, he now had a method to identify and characterize key genes involved this process. This was a major break-through, and Ohsumi published the results in 1992. Next Ohsumi exposed yeast cells to a chemical that randomly introduced mutations in many genes, and then he induced autophagy. Within a year of his discovery of autophagy in yeast, Ohsumi had identified the first genes essential for autophagy. In his subsequent studies, the proteins encoded by these genes were characterized. The results showed that autophagy is controlled by a cascade of proteins and protein complexes, each regulating a distinct stage of autophagosome initiation and formation. Thanks to Ohsumi and others following in his footsteps, we now know that autophagy controls important physiological functions where cellular components need to be degraded and recycled. Autophagy can rapidly provide fuel for energy and building blocks for renewal of cellular components, and is therefore essential for the cellular response to starvation and other types of stress. 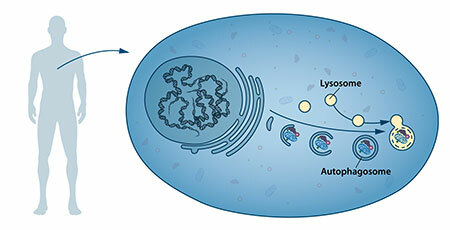 After infection, autophagy can eliminate invading intracellular bacteria and viruses. Autophagy contributes to embryo development and cell differentiation. Cells also use autophagy to eliminate damaged proteins and organelles, a quality control mechanism that is critical for counteracting the negative consequences of aging. Ohsumi’s discoveries opened the path to understanding the fundamental importance of autophagy in many physiological processes, such as in the adaptation to starvation or response to infection. Mutations in autophagy genes can cause disease, and the autophagic process is involved in several conditions including cancer and neurological disease. With this wealth of new knowledge, novel therapies for diseases as varied as Parkinson’s disease and other neurodegenerative diseases, as well as different forms of cancer, can be developed.